Here’s the result. I used a Pilot G2 pen (as they are my favorite) and I ended up using the Dremel to widen the tip of the pen a bit so the conductive foam could fit through the hole, and I also used the drill press to put two small holes in the barrel of the pen for the wire to go through. (I wanted to avoid using tape as Collin did.) 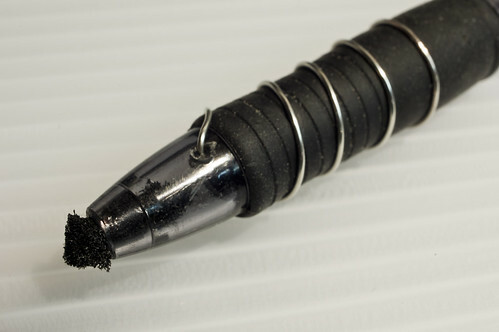 I actually drilled right through the rubber grip and into the pen. The end of the wire then got pushed through the rubber grip, through the pen barrel, and got pulled tight inside the pen. You can see some of the excess wire near the middle of the pen. You can also see an extra hole near the tip, as I drilled all the way through with the drill press. I won’t call that a mistake, as I was still figuring out how I was going to make it all work at that point. I tend to do that… plan as I go. Here’s a close-up of the tip, where you can see the hole that the wire feeds out of. You can see the tip created with the conductive foam. I’m not 100% happy with the tip. I don’t know if there are different hardnesses of conductive foam, but this seems too soft. I also probably could have used a bigger piece of foam, but it ripped while inserting it, so I just left it as is was. So… does it work? Yes! 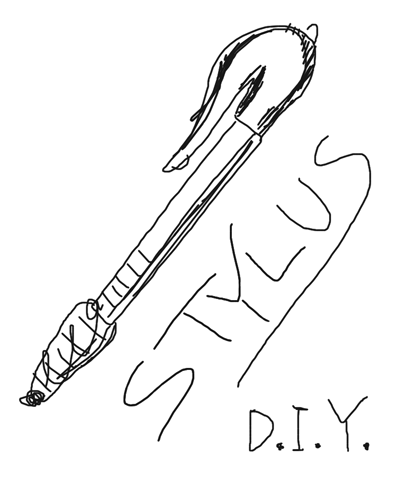 Here’s a really bad drawing I made using the stylus and Doodle Buddy on the iPad. The whole process of making this probably took 20 minutes, and I did already have all the tools and materials on-hand. P.S. I like making things. Posted on Wednesday, December 29th, 2010 at 8:19 am. Subscribe to the comments feed. Both comments and pings are currently closed. Post on your own blog. If you want an even quicker and easier way to make one you can just use the bottom side of a AAA battery. That works pretty well too and you can just keep it in your pocket. Necessary? 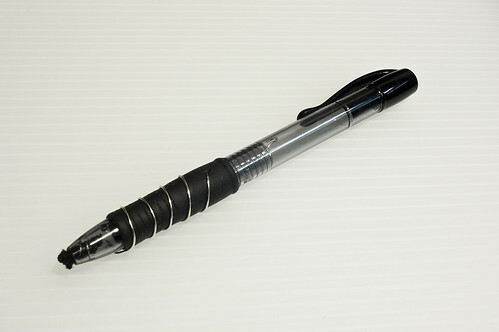 No… I would not use it for typing, but for drawing or writing, some people prefer the more pen-like experience a stylus provides.